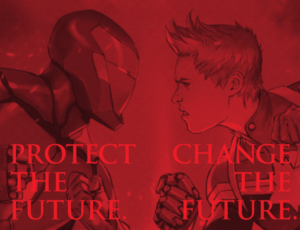 Civil War II had a lot of promise in its premise: that there’s another issue important enough to the superhero community that they would take sides and fight over it. In this case, it’s the Terrigen cloud released by the Inhumans on Earth, which turned one regular kid into an Inhuman with a power that changes the playing field. SPOILER WARNING. Spoilers for Civil War II #0-8 follow. Continue at your own risk. That human is a college-aged boy named Ulysses. He encountered the Terrigen cloud on campus in Ohio and developed what appeared to be infallible precognitive abilities that began as just visions, but soon became psionically shared episodes, complete with sensory and emotional impact to anyone who is in his presence during one. 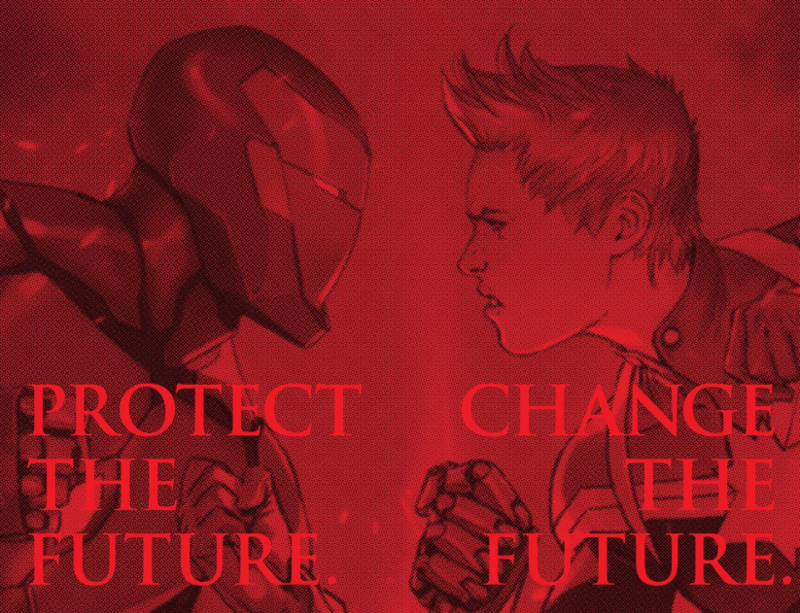 Team Captain Marvel: change the future for the better by stopping disasters before they could actually become disasters. The series was an interesting exercise with a lot of problems, large and small. I tilted my head in bemusement as She-Hulk goes from making an argument against arresting someone and prosecuting them “for what they talk about and think about,” only to join the side of stopping futures from coming to pass and telling Danvers to fight for it against Stark. 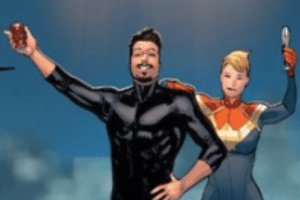 I winced again when Bendis and the editorial team seemed to forget that Carol Danvers is also an alcoholic in recovery and had her at the issue one victory celebration with what looked like a glass of champagne while Tony Stark drank canned cola. I stuck with the series because I wanted to see where it was going, even though I know the tropes well and can often guess the ending. Usually when a story catches me by surprise, it’s pleasant because there has been a refreshing twist from the expected use of the tropes involved. Civil War II caught me by surprise, but I wasn’t delighted. I knew, as a reader, that Marvel couldn’t let Civil War II end with Danvers’ side winning because precognition as a rule is a story breaker. But somehow…her side did win. I am left disgusted because after issues and crossovers increasingly showing Captain Marvel being wrong for her increasingly violent insistence on arresting people for things they haven’t done yet (a la Minority Report), it ends with her not having to take her lumps for it. I was not enamored with some of the choices made about which heroes went along with Captain Marvel’s side, but I understood them. Storm’s group of X-Men as of this writing may not all be aware of or remember Days of Future Past, but Storm herself does, and that gives her a valid reason to want to prevent potential bad futures happening, especially in light of the Terrigen crisis making mutants literally an endangered species. The baby group of X-Men pulled into what is, from their perspective, a horrible future, chose the side of not mucking around with time. These rationales were internally consistent for each team, at least. I grit my teeth and read on. Peter Parker being all “great power, great responsibility” would of course want to side with what might save the most lives and help the most people. Until recently, he’s been a poor boy from Queens just doing what he can to keep New York safe. Now he has Tony Stark level money and can use his scientific genius on a larger scale. He and the Human Torch worked together with Ulysses. As is most frequently the case for Spidey, his best intentions take a turn for the worse and he eventually decides that perhaps knowing the future in advance isn’t the boon it appears to be. I shook my head and kept reading. I am not entirely sure what the Guardians of the Galaxy had to do with any of the fracas, since they’re not usually an Earthbound team. I don’t follow their title, nor did I pick up their crossover issues. So their presence seemed contrived, except to make an interesting fight scene when Danvers needed some backup. Damning my completist tendencies, I still kept reading. The Inhumans, because Ulysses is one of theirs, and has the power being fought over, had no choice but to stand with Danvers. Queen Medusa leads them, and it was her choice to use Ulysses’ abilities as a show of goodwill to humanity. But she also wants to make sure that while Ulysses’ abilities are used, Ulysses himself is not abused in the bargain. Other than “they need the walking plot device to keep the story going,” it’s unclear why Medusa kept sharing his visions with the other heroes. If that’s the only reason, it’s a meta reason and weak writing on Mr. Bendis’ part. I admit some of the fallout is going to be interesting — due to the scheduling problems with getting the series out on time we’ve already seen some of the results. The young heroes: Ms. Marvel, Nova, Totally Awesome Hulk, and Miles Morales Spider-Man have become disillusioned with the adult heroes. Watching them tear each other apart and be willing to kill over a future that “might” happen caused them to quit the Avengers and form the Champions. Three issues of this new title are already on the stands. I’m interested in this team and looking forward to seeing where it goes. Alison Green, unjustly arrested by Danvers without evidence, is now out for revenge and has pulled Jessica Jones into the plot. Jessica Jones took a very long time to grow on me after her own series, Alias. But I’m curious to see where this will go. She-Hulk was badly injured in the same fight that killed War Machine. She lay comatose for most of the fighting, and upon waking, learned her cousin Bruce, the original Hulk, was killed by Hawkeye at Banner’s own request and was acquitted of murder. Her transformations are affected, and she’s gray with green scarring as a result of her injuries. We’ll see more of that story in the new Hulk, which came out the week of January 4. One issue isn’t enough to tell whether this change is a good or interesting one. Tony Stark is no longer capable of being Iron Man, but a young black girl named Riri Williams is going to be taking his place with the help of an AI based on Tony’s own personality because Tony foresaw, in a more mundane manner than precognative visions, his own inevitable incapacitation. Two issues of her title, Invincible Iron Man, have already come out as well. The Inhumans are still on Earth, but now have the breakdown of their truce with the X-Men to focus on, since the Terrigen that gave Ulysses his powers is also poisonous to mutants. Inhumans vs. X-Men has released issues #0 and #1 so far. The Ultimates, due to infighting on the national stage, have been disbanded…but have been called back into service as the heralds of the reformed Galactus. Their re-numbered title has an issue on the stands. Bendis and Marvel went for a cheap, unsatisfying ending. From a feminist standpoint, the story regarding Captain Marvel is supposed to be cool: this time it’s a woman standing up for what she believes in and not backing down in the face of opposition from an arrogant man! Princess Sparklefists, the Boss of Space, is ready to fight to stop terrible things from happening. She is acting out of the desire to protect! She even called in Spider-Woman to help her confirm the veracity of Ulysses’ visions. But the more I read the uglier it became. Every issue of the title and the few crossover issues I read, tilted my opinion further and further toward thinking Tony Stark has a valid point, and Carol Danvers is not only okay with profiling, she actively supports it, is willing to fight dirty in its defense, and all other considerations be damned. Tony Stark did kidnap Ulysses, but he also didn’t do him any significant harm; Tony flicked Ulysses on the cheek and threatened to hit him and tickle him, nothing more. Calling that torture was a bridge too far. He gave Ulysses back the moment the Inhumans came for him. He only needed the kid long enough to get data to test his theories and prove that the visions were not the future but a possible future, and as such, not immutable or infallible. He also acted to protect Miles when Danvers reneged on her promise to not pre-emptively arrest Miles for what he might do in the vision Ulysses shared of him holding the body of an apparently dead Captain America. The more pushback Carol got, the more emotional she got, and the harder she pushed back in response until the final issue had her literally trying to kill Tony Stark, all the while yelling at him that she forgives him, asking him to stand down and reminding him that she warned him she wouldn’t hold back — as if that makes it okay for her to attack a human whose only defense against her is a suit that won’t withstand her full powers. She was being portrayed as less rational and more emotional, and so married to her belief that she was willing to let it cost her friendships and the lives of others. Essentially she was a personified Sunk Cost Fallacy: the writing makes it come across that the more effort Danvers put into defending her position, the more effort she needed to keep putting into it, no matter what it costs her or others, to the point of being willing to kill to defend it. She thinks it so important that there’s no line she won’t cross to use future foreknowledge. No vision from Ulysses would bring back James Rhodes, who died in the second Ulysses vision Captain Marvel and the Ultimates tried to prevent from coming true. But she’s put in so much effort she can’t back down or it’ll feel wasted. When it finally came to an end, though, despite her being indirectly responsible for the death of Bruce Banner (she took a Ulysses vision of a devastating and lethal Hulk rampage as truth and sought to take him in before he could rampage, resulting in Hawkeye fulfilling a promise he made Banner to kill him), and directly responsible for the coma in which Tony Stark now lies, she comes out with no feathers ruffled. 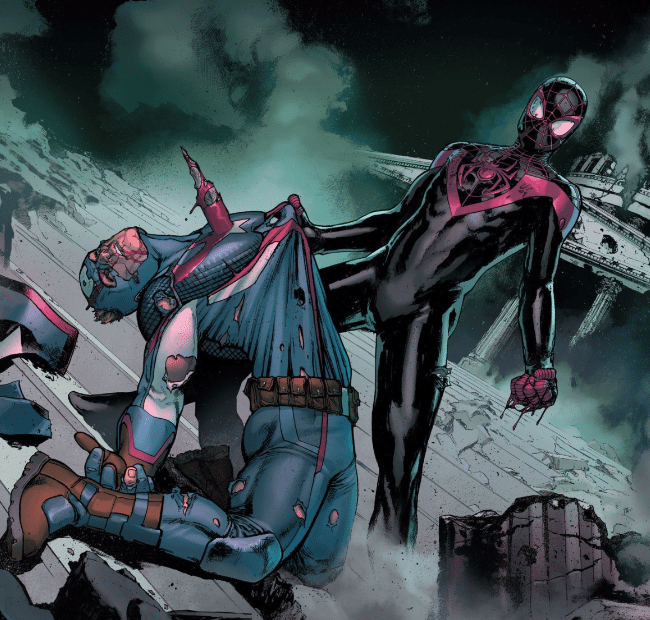 Worse, fallout from her final fight with Stark is what knocked Captain America down and could have easily resulted in that shot of Miles holding his dangling and battered body. The President commends Carol for the good work she’s done, and tells her that no matter what the American people say on Facebook they don’t want to have to face the hard decisions or deal with them as long as they get to wake up the next day. He tells her that since Rhodey’s dead (so sensitive, Mr. President, considering Danvers was romantically involved with him) and the President wanted Rhodey to write his own ticket, now Danvers can! The death of James Rhodes was problematic when it happened, since he was a black character and, like the first Civil War series, was the first casualty that set the tinder box alight between the heroes. So it’s doubly insulting here to see the president casually toss Rhodes’ name around like he was a pawn rather than a decorated hero in his own right for both the Marines and the Superhero community. 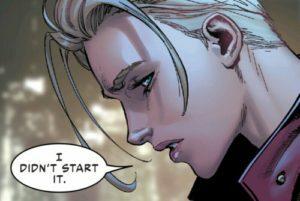 Carol Danvers comes out looking good, as if none of the blood is on her hands. She got the Guardians of the Galaxy’s ship destroyed. She got the Triskellion destroyed. She profiled Miles Morales and held Alison Green without evidence or due process. She caused indirect harm to civilians when Ms. Marvel followed her edict without question, until Ms. Marvel realized it was profiling and lost faith in her hero. Worst of all, Danvers faces no consequences for any of that. She tries to say she feels bad about the consequences others are facing as we see Miles hunched over on a rooftop in tears, and an enraged She-Hulk, but those are all but handwaved. The president and those friends she still has talking to her just remind her of how many lives she saved. Everything else is just…collateral damage, I guess. She’s still got her official Air Force rank. She’s still Captain Marvel. Ulysses as a point of contention is no longer an issue for her –or anyone — because his Inhuman powers conveniently evolved him right off the playing field as he became a literal cosmic entity on par with Eternity. As of the last issue of the series, there were no charges against her for her brutal attack on Tony Stark or for starting a fight with him in Washington, DC, where the airspace is most restricted. The worst things that Carol has had to deal with as a result of supporting precognitive profiling? She’s lost Ulysses as a tool, effectively ending the war without clearly answering the question, unless you consider beating Iron Man within an inch of his life answering the question. She’s lost Ms. Marvel’s idol worship and Spider-Woman’s friendship. She may have also lost the friendship of the former She-Hulk. She is still in the cat-bird seat as a beloved hero in the eyes of the world, even if some of her heroic friends call her out in private. That’s meta: she’s got a movie coming out so she can’t be less than a bona fide good guy right now. She lost the Ultimates team too, but immediately got them back. The worst insult to the injury of having to read eight off-schedule issues of this story was that Beast rushed to comfort and console Danvers, who petulantly says “I didn’t start it” like a grade school kid. Tony’s futurist tendencies (and history of his heart getting damaged repeatedly) gave him the foresight to put himself on pre-emptive life support so at she’s at least not going down in history as having killed Tony Stark. Beast comforts Carol by telling her Tony really did trust her; who he didn’t trust were less-noble types who might let their personal feelings color the usage of knowing the future. The problem is Beast isn’t one of the X-Men’s telepaths. There was no conversation between him and Tony Stark in the pages of Civil War II to indicate Tony told him this. Worst of all, we don’t know for a fact that Tony really did trust Carol. We never see on the pages of the miniseries that he says so, and no one can ask him what he said because he’s in a coma thanks to Carol’s refusal to stand down even when the future visions were beginning to prove unreliable. 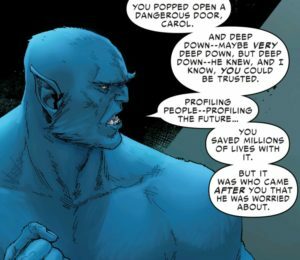 We know Carol didn’t trust Tony from well before the final issue; she flatly refused to accept his findings on Ulysses until Hank McCoy corroborated them. Even then, with McCoy backing up Stark’s contention that the Ulysses visions were a possible future, not the possible future, she insisted Stark back off and stuck to her metaphorical guns. At least Hawkeye, who had to go to trial for murder thanks to her, points out that she’d become unlikeable and it was nice to have the regular Carol back. She gives him the hairy eyeball when he asks her to trust him, though — and Occupy Avengers will shake down from this confrontation. 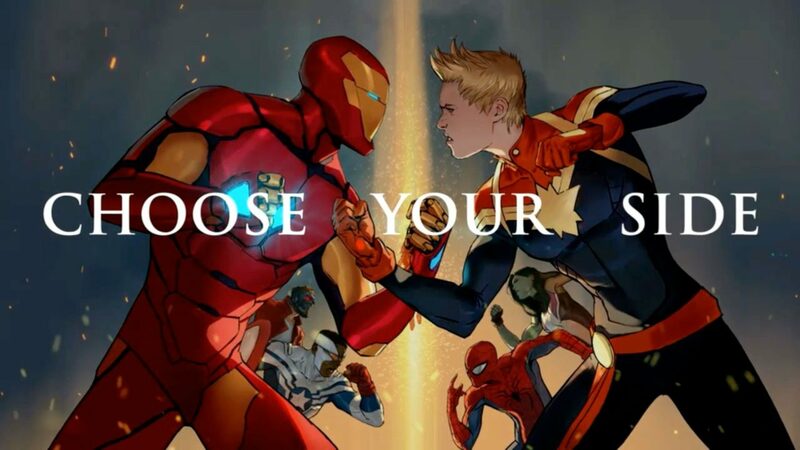 The Oath, the post-game show for Civil War II, comes out January 25. At this point I don’t think there’s anything that will un-disappoint me from this ending. I’m willing to be proven wrong, though.